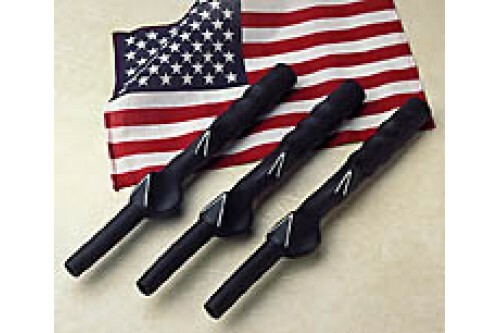 Matzie Golf Company introduces a new improved training grip that’s made in the USA. The Matzie Training Grip is exclusively designed to mold the hands into a standard Vardon overlap or interlocking grip. The fingers fit around ridges that serve as guides for the correct hand position, while two V's (painted white) indicate the proper placement of the thumb and forefinger of each hand. The Matzie Training Grip is great as a teaching aid, or install it on a practice club to make the correct grip become second nature. The exclusive Kraton material provides a soft and tackie feel throughout the life of the grip. The grip will never harden, crack, or get slick, and tackiness can be restored by cleaning with soap, and water. The material is non-porous. It won’t absorb water or perspiration, and the grip can be towel dried in seconds. The retail price for the Matzie Training Grip is only $6.50. Available for right and left hand in sizes for men, women, and juniors.